Professional monitor headphones from M-series that deliver accurate audio and outstanding comfort, perfect for long sessions in the studio and on the go. They are equipped with proprietary 45 mm large-aperture drivers with rare earth neodymium magnets and copper-clad aluminium wire voice coils, and contoured circumaural ear cups that swivel 90° for one-ear monitoring and perfect isolation. Their collapsible design makes for easy storage and professional-grade ear pad and headband material delivers more durability and comfort. Headphones provide an exceptional clarity thanks to the extended frequency range 15-28000 Hz, with sensitivity of 99 dB and impedance 38 Ohm, and deep, accurate bass response. Three detachable interchangeable cables are included: 1.2 m- 3 m coiled cable, 3 m straight cable and 1.2 m straight cable, with golden-plated stereo 3.5 mm connector; as well as protective carrying pouch and 6.3 mm screw-on adapter. Maximum input power: 1600 mW. Weight: 285 g (without cable and connector). Black, white or blue colour. 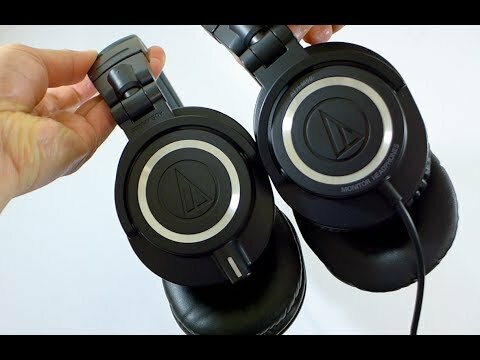 Do you own Audio-Technica ATH-M50 X Black or have you had a chance to try it?